This is the yearly look at what is the most important game event in Europe, and the coverage it has generated around its latest edition. While the event has always been in August, this is the first time that it’s been staged during the same week of August as the previous year. The event was also on the same days of the week as last year, a change from the previous formula (it now happens from Tuesday to Saturday instead of Wednesday to Sunday). There were no major press conferences at gamescom this year from any console manufacturers, or any of the main publishers. There was an official press conference/opening ceremony, though. It was not incredibly impressive. 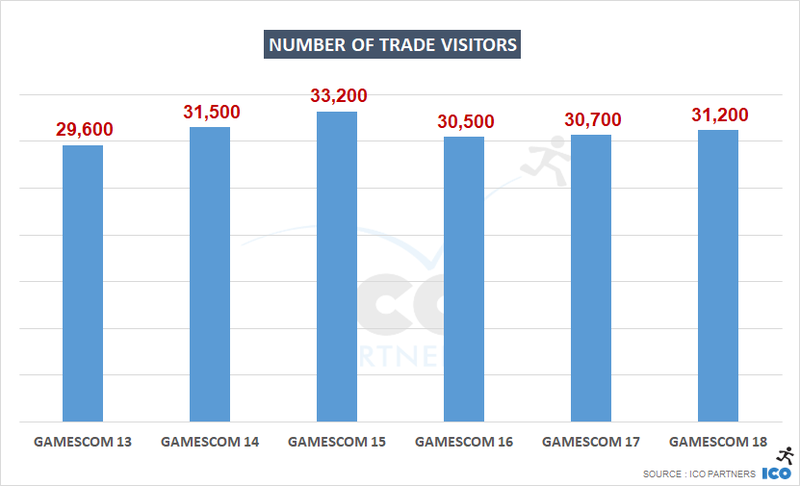 This is the first time in a while that gamescom has seen significant growth in its consumer attendance. This is impressive, because as an event it doesn’t obviously have much room to grow. The Kolnmesse is a huge exhibition complex, and almost all of its halls are used for gamescom; and while they are not necessarily full, the spaces that are a bit empty are very much welcomed by attendees, considering how packed it can be everywhere else. 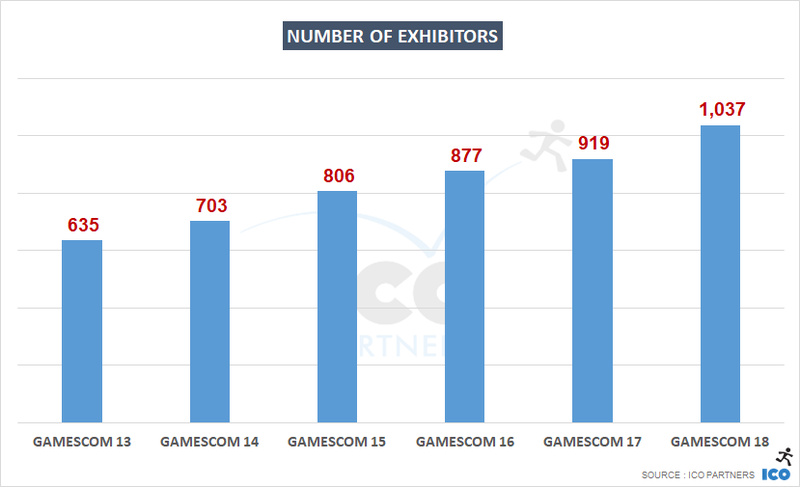 This is also the first time that gamescom has passed the 1,000 exhibitors mark. That’s 18% fewer articles than the previous year, and the lowest total since we started tracking this data. Arguably, the best year, 2015, was the first one that Sony skipped for its conference, but Microsoft had a strong line-up that year. 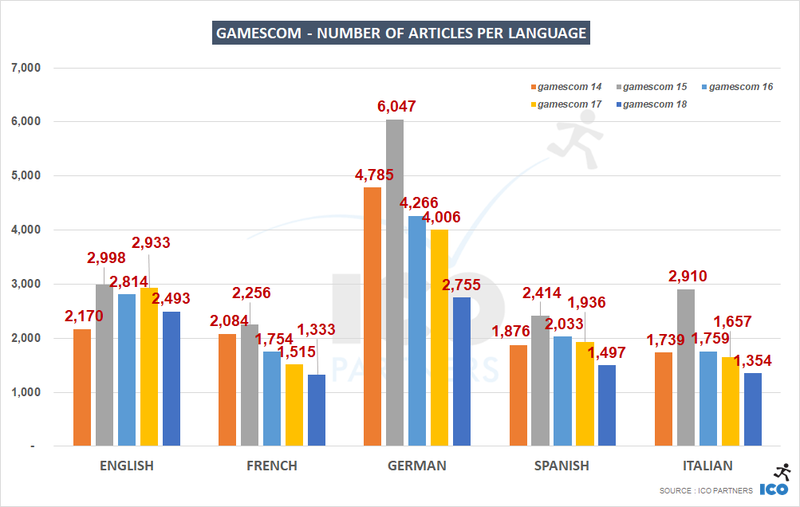 The most impressive take away from the numbers, when broken down per language, is the massive drop of English media mentioning gamescom. 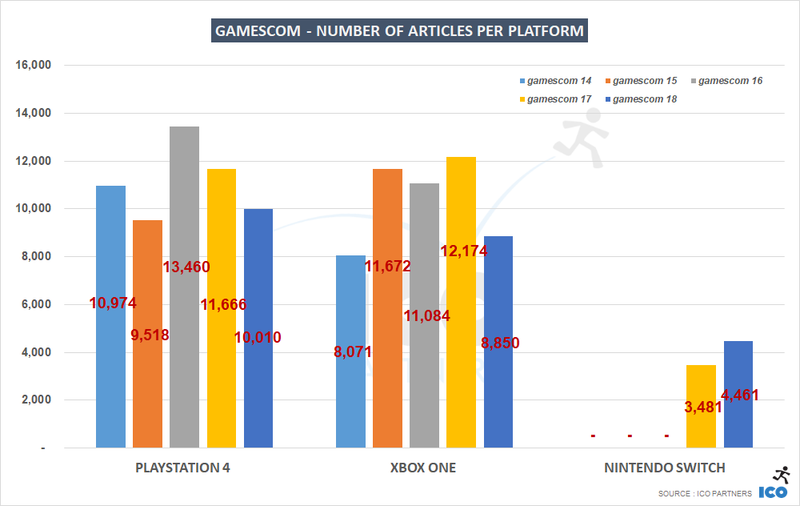 I can easily see why: without a distinct headliner to encourage English-language (especially US) media to attend, outlets have been keener this year to save on their budgets and limit their presence at a European show, in comparison with mainland Europe media numbers (although these also indicate a slower year, compared to 2017’s gamescom). 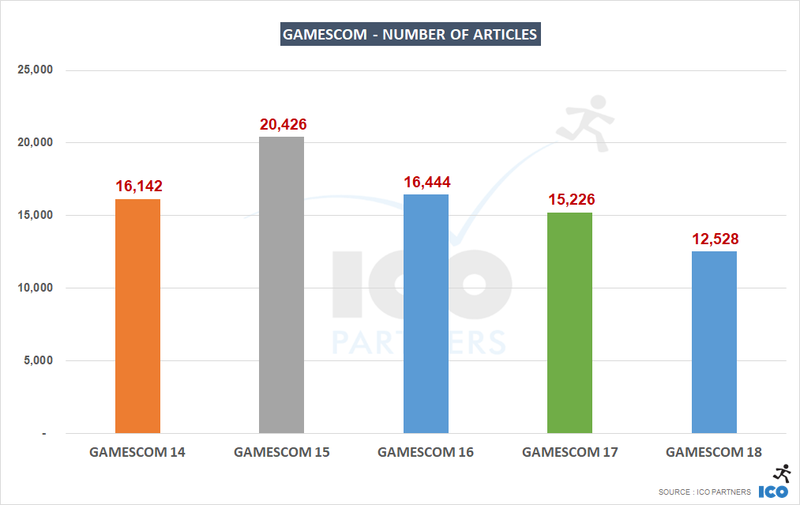 Both PlayStation and Xbox saw a drop in the number of articles mentioning them during the week of gamescom compared to last year, even though that drop is not as significant as the one in the number of articles mentioning gamescom. The absence of an Xbox conference compared to the previous year means that Xbox’s coverage dropped below PlayStation’s in 2018. The Nintendo Switch is the one platform actually improving its year-on-year coverage numbers. It is very much the console that has a lot of the media’s attention right now. It also helped that Nintendo broadcast a Nindies Showcase on the Monday. 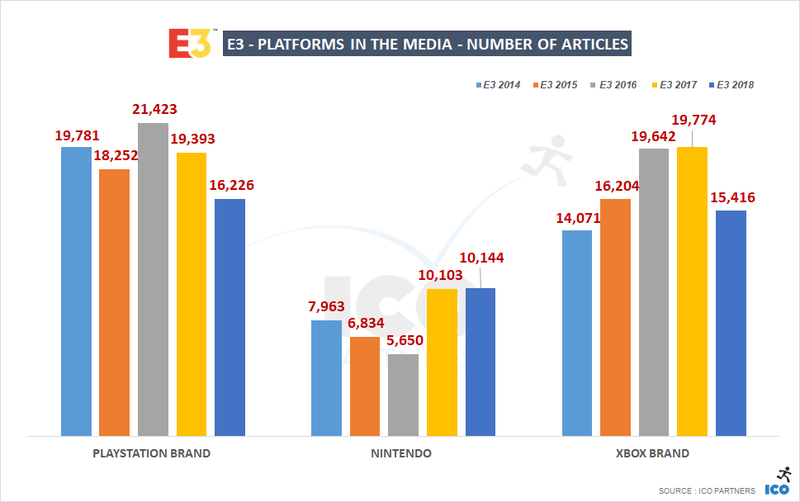 It is still playing catch-up in terms of volume of articles compared to its two competitors, being at half of where the Xbox One is. Looking at last year’s main games is quite revealing. All of the games in 2017’s top 30 were covered by 500+ articles during the week of gamescom. 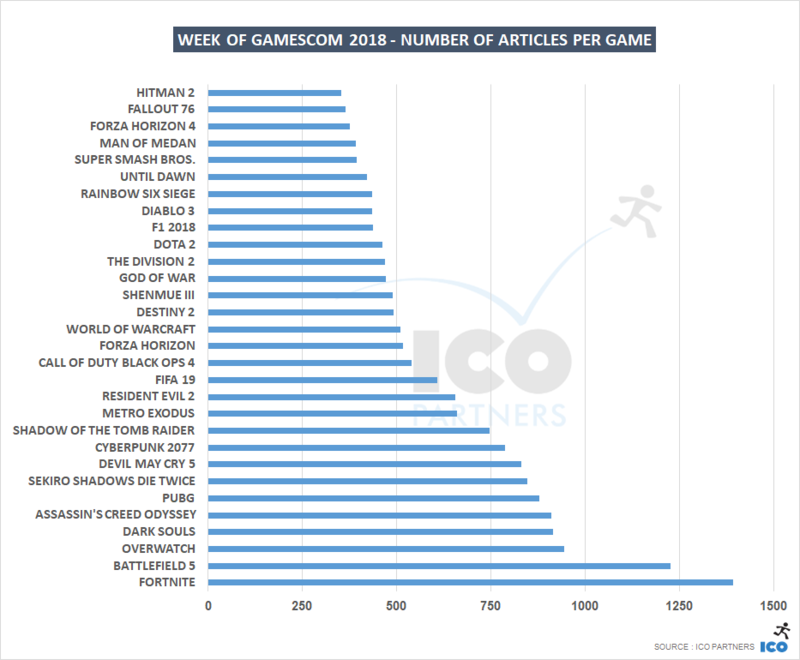 And here we are in 2018, with only just half of the games in the top 30 having 500+ during the week of gamescom. Of the games featured during gamescom 2018’s opening ceremony/press event, only Shenmue 3 (announcing the release date) and Man of Medan (game revealed) are in the top 30. In 2018, gamescom turned 10 years old. On the attendance front, it broke all its records (well, most of them). However, there is something to be said about the media coverage, which seems to have been at it lowest since we’ve been tracking the data. 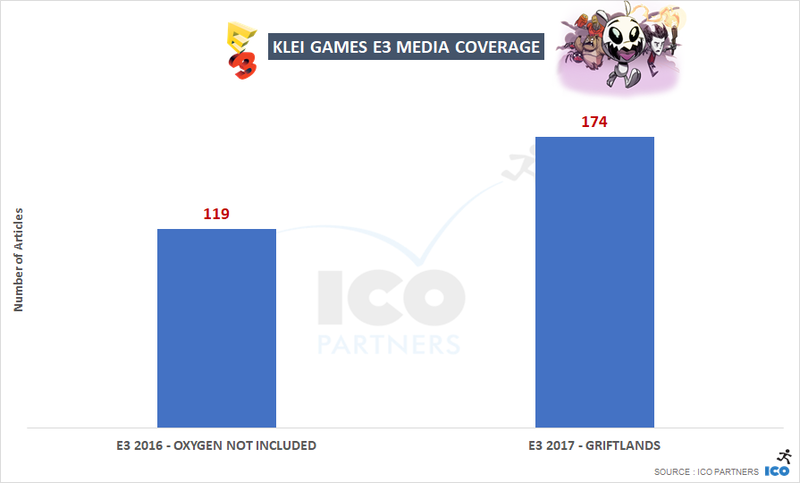 And while our methodology might be a factor here (the same way it might explain part of the numbers of the last E3), the absence of strong press beats for new games is also very important. 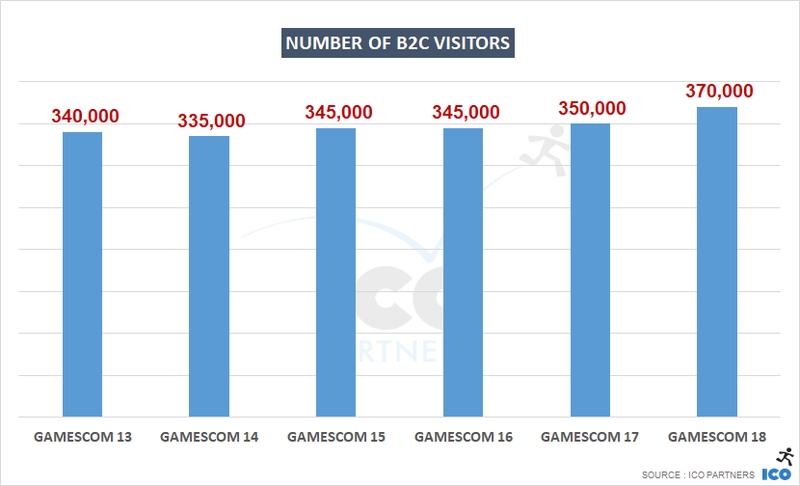 At ICO Media, the team has been working on projects present at gamescom for several years, and there is anecdotal evidence that media shied away from this year’s gamescom, if not entirely, at least shortening the number days where they attended. If gamescom is to keep its status as the second-most prominent event for the game industry from a media point of view (and even this year’s sub-par performance doesn’t challenge this), it will need to find a way to get a few more major announcements back, to make it a must-attend for journalists. Last Minute Bonus Section – But what about VR? Sam Watts from make[Real] asked me about the media coverage of VR during gamescom, literally as I was wrapping this up – his timing was so impeccable that I did a very quick check on both Oculus, the HTC Vive, and PlayStation VR, and the volume of articles mentioning them during the week of gamescom. Unsurprisingly, the hype around VR, at least at this type of very consumer-focused game events, seems to have moved on. 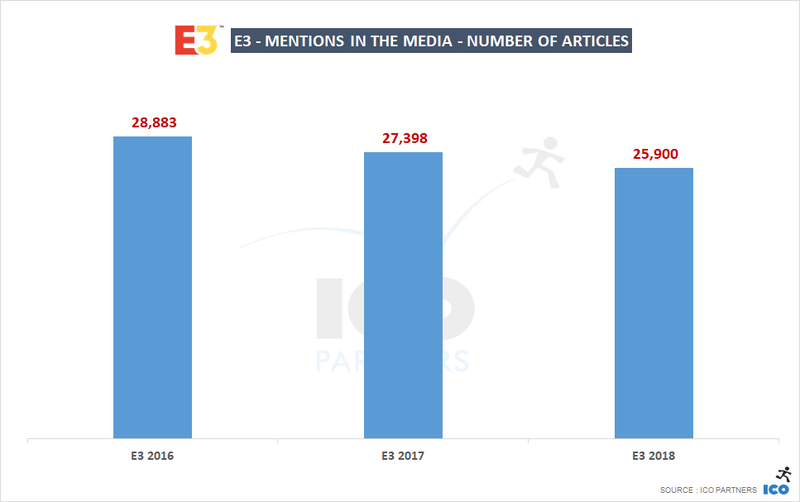 Like every year, this is the time for a look at the performance of the many E3 announcements in terms of media coverage. If this the first time you read about our analysis, you can find out more about the methodology used, and read the blog posts for 2015, 2016, and 2017. 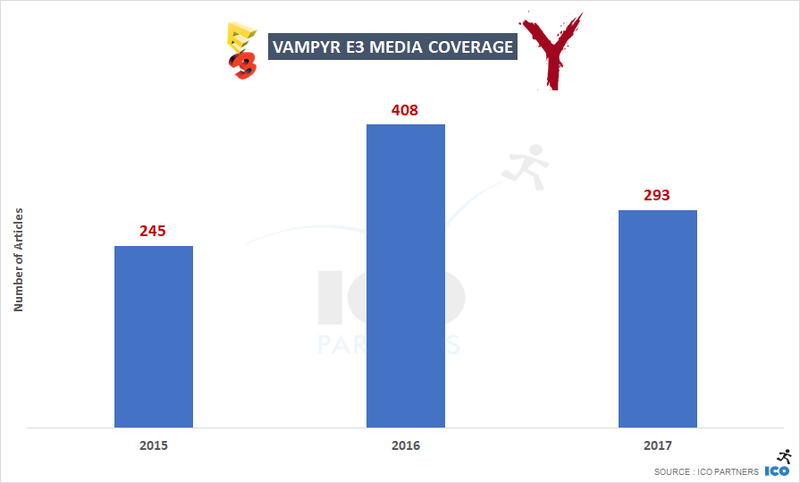 Starting with 2016, I set up a media tracker to measure the media coverage for the E3 itself. It tracks all the articles that mention the event, and is a good indicator of the scale of a particular year’s crop. As you can see, 2018 was a decline year in terms of total volume of media articles mentioning the event. I am not sure this should be particularly worrying, or even surprising. While there were great games revealed during the week, it was also particularly light on industry-changing announcements. We are well into the cycle of this generation of consoles, while the rumours on the next gen are growing, there was nothing to feed many articles. 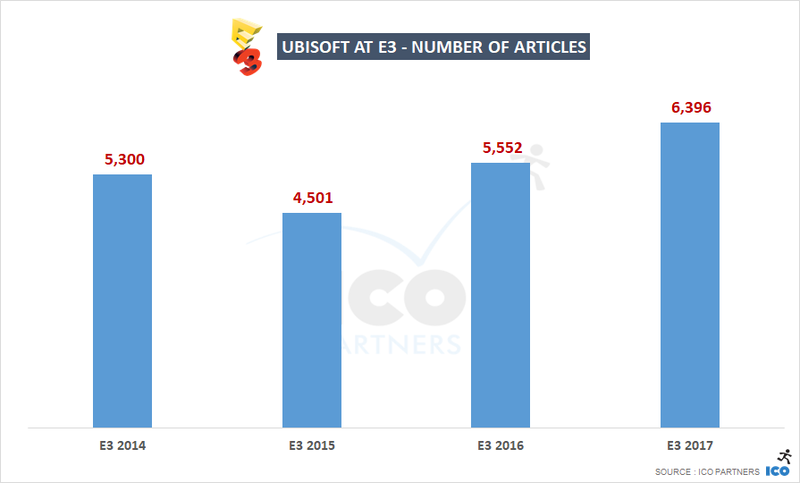 The same goes for new technologies, like VR and the impact it had over the past two E3s. It’s good to note that there has been a decline, and while it is merely a 5.5% drop, for an event of that scale, it could be an indicator of a trend. Looking at the performance of the key brands for the consoles, the downward trend is much more significant. It is the worst year for the PlayStation since we started measuring, and the worst year for Microsoft since 2014. I have to confess I am surprised that Microsoft’s performance ended being at this level. I felt they had a very good conference, and while their line-up is still behind, they had better announcement than last year. It seems like it wasn’t enough to compensate a hardware communication, like the Xbox One X and the Xbox One S last year. As for Nintendo, 2018 was their best year, even if, arguably, the volume of articles mentioning them is very close to last year’s. This validates very much Nintendo’s strategy to not have a traditional press conference. At the very least, it doesn’t seem to prevent them to secure a significant volume of media coverage. 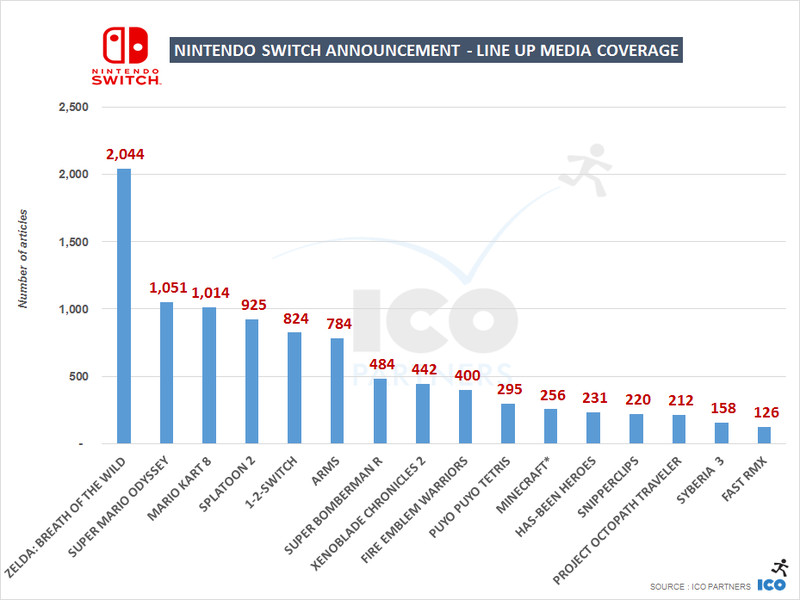 Nintendo also benefitted for the first time in a while from the media coverage around 3rd party titles, with their Fortnite announcement being spot on with the current Battle Royale frenzy. Looking at the specific platforms mention, we find the same ranking in the top 3. What is significant though here is that the platforms outside of these three consoles have ridiculously low coverage numbers compared to previous years. And in case you were wondering, E3’s fling with VR is mostly over. Fortnite had so much going for it during the week of E3: Nintendo Switch port, Celebrity Pro Am event, and the controversy around the crossplay restrictions on the PlayStation 4. 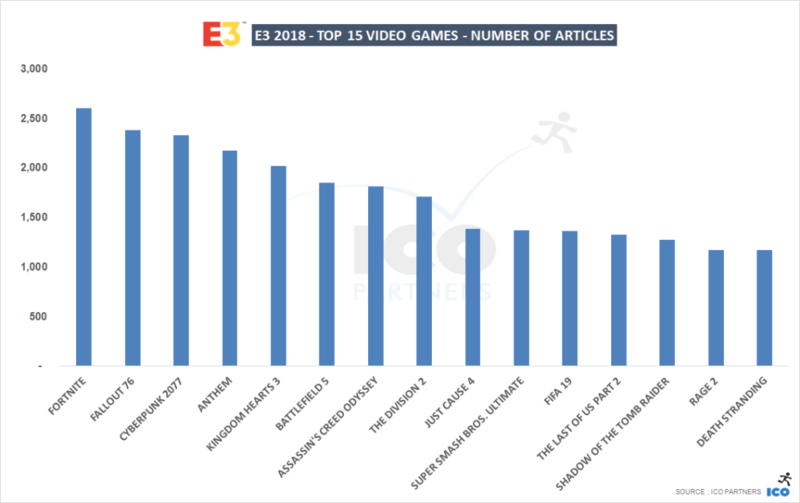 Add to this that Fortnite has been a very popular game with the media in the past few months, it doesn’t come as a surprise it managed to dominate here. Fallout 76 is following in the steps of Fallout 4 when it was first showed at E3 in 2015. It has not dominated the way F4 did then, but it makes sense for the game to be so well covered. Cyberpunk 2077 is the real winner for me. While it didn’t get the most coverage, it certainly did very well for an “original” IP, surfing on the media interest for The Witcher series, and the high expectation everyone has for the next CD Project rpg. Super Smash Bros. Ultimate is the first console-exclusive of that ranking, beating The Last of Us part 2, an upset in my mind. Looking at the most mentioned games from the three largest studios with a press event, this year’s numbers are lower than last year’s. It is quite notable in the case of EA’s games. There has been a decline in the coverage received for their most covered games compared to last year’s. It might come from the fact the lack of renewal of their franchise, considering their 3 most covered in 2017 were Anthem (same as this year, without the novelty factor), Star Wars Battlefront 2 (another FPS from DICE), and FIFA 18 (yearly cycle doesn’t help standing out). On the overall coverage mentioning the publishers’ brand, Electronic Arts is still ahead. 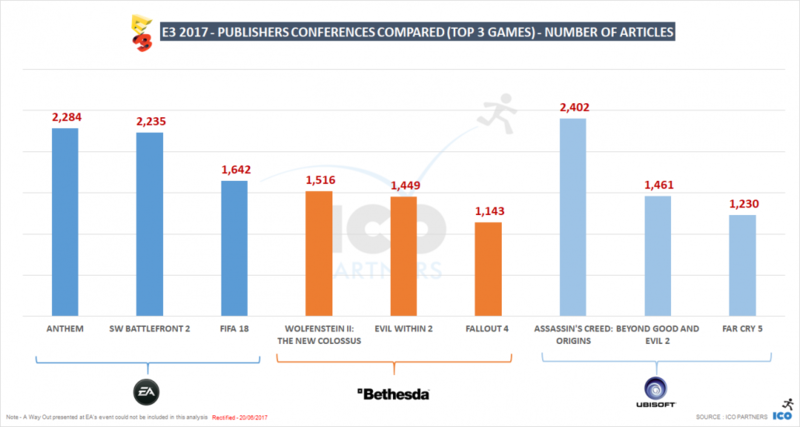 The notable changes from last year is the relative growth of Bethesda’s presence, taking the second spot away from Ubisoft that saw a drop. Also interesting is the seemingly lack of interest in Activision in this year’s E3, losing its ranking at 6th to SEGA. This E3 was very much an intermerdiary year. Despite some very exciting games being revealed, the overall numbers are lower than previous year. It sets up 2019 to be a very exciting edition. I am also looking forward to the next press conferences from Nintendo and Sony, who have not been shy in keeping bombshell announcements for their non-E3 communications. 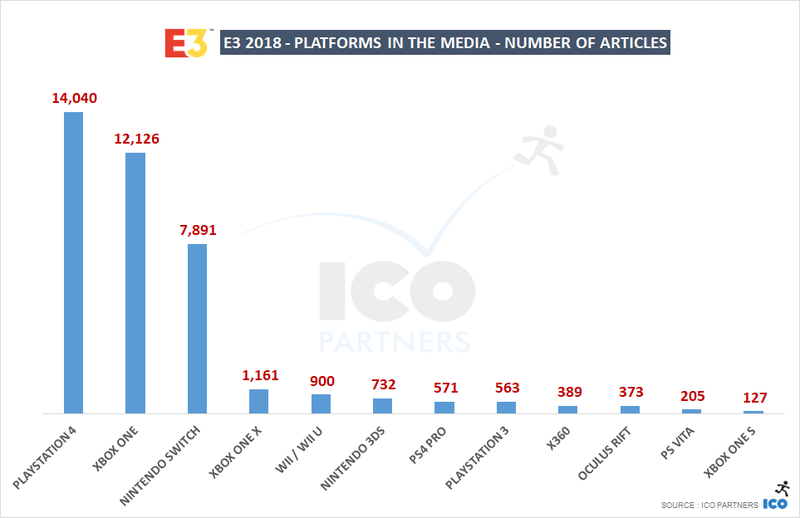 You might be familiar with the different analysis we conduct around key media events of the games industry, such our regular E3 and gamescom media coverage analysis. We have in the past used the same tools to help games companies better understand their PR actions and identify ways for them to improve their reach. I have been meaning to build a simple case study to illustrate this type of analysis and today we are releasing a case study on the media coverage of Nier: Automata. Why do this case study? The modern media landscape is evolving very quickly. With these changes, we see new media emerging, and we are also in a better position to measure and understand the impact of specific communication efforts. However, there are not many benchmarks around to compare performance of these actions. By building a case study, albeit around a popular game, this is a first step towards providing reference points in that field. Why using Nier: Automata for this? 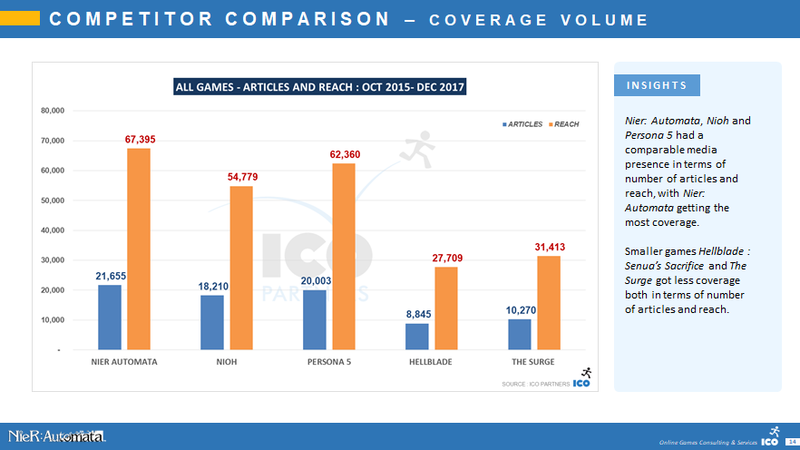 We wanted to study a game that has been a clear success, with a significant volume of coverage across multiple territories to have statistically relevant numbers. We avoided titles that have been so successful at securing coverage that anything we would have uncovered would be useless to anyone as it would have been a “black swan”, unique on its own. What was the methodology used? 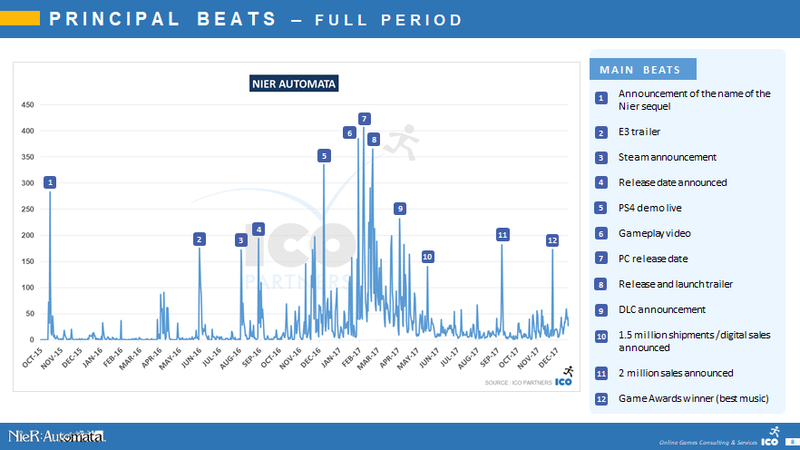 The report is short and to the point – it looks at how well different beats performed for Nier: Automata, from an online media coverage perspective. And we compared Nier: Automata to a handful of games that seemed relevant because of their genre and their release window. The report is free to download on Gumroad – and you can find it and our other reports in the Publication section of the website. For almost seven years, part of my job in the video games industry has been to look at, analyze and predict review scores of games. I’ve done this for a variety of different clients, from my previous employer EA to a host of smaller and bigger indie developers. At ICO, we have quite a bit of experience and knowledge in supporting game launches. Whenever a release of a game comes close, one of the things that always pops up, without fail, is Metacritic and review scores. Quite a lot of times, we are answering the same questions and dispelling the same myths. That’s why I thought it would be nice to have all those answers in a handy, online guide. If you use or are interested in Metacritic, the following Six Tips to Get a (Better) Metacritic Score might be for you. Before we start, a little disclaimer. We won’t be talking about the ramifications of a review score, or if they are really necessary, or if we should just use user or Steam reviews instead. We also won’t be talking about that other excellent aggregated score platform, Opencritic. With that out of the way, let’s begin. Why Care About a Metacritic Score? Well, why should you care about Metacritic? First off, regardless of whether you think Metacritic is relevant or not, it shows up in some interesting places: for instance, on the Steam store page of a game, as well as in Google results if you search for a specific title. And, of course, it is still relevant if your client, employer or publisher cares about it for internal accountability or development milestones. Depending on the genre, platform, type of outlet and popularity of a game, an AAA title can see over 100 critic reviews on Metacritic, but the vast majority of the games will only be reviewed by a handful of outlets. In most cases, indie games won’t get a Metascore at all. That’s a shame because there are some relatively easy tricks to get listed and to boost the number of review scores. A game needs 4 reviews to receive a Metascore. If your game is multiplatform, each individual platform will need a further four scores before a Metascore for that platform is listed. Reviews are never counted twice across the platforms. Metascores change their colour from acclaimed green to yellow at 75, and from yellow to that fearful red at 50. A Metascore stabilizes around 20 reviews. Before this happens, every new score added can change the aggregated Metascore pretty significantly. 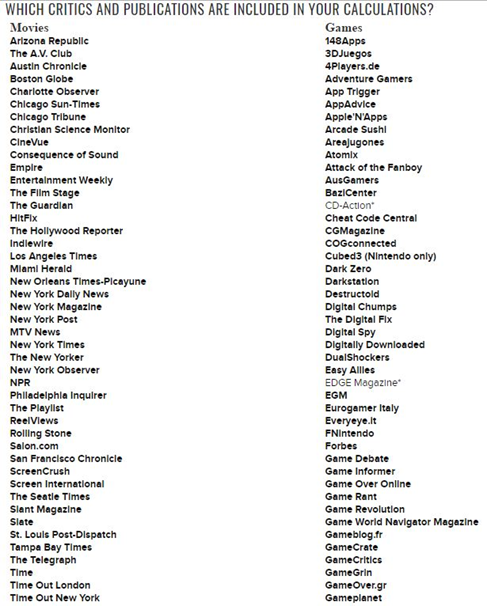 The official media list is divided in general interest media (left) and game media, both print and online websites (right). The outlets on the right are the ones to watch out for. The total list contains roughly 170 different game websites, from the well-known IGN to Spanish big hitter Meristation and renowned general interest news site, The Guardian. There are also some other general interest media such as the Washington Post or the New York Times listed, but these only are relevant for the biggest of titles. There is no country listing, but at a glance, it’s easy to see that the vast majority of the media listed are English speaking. There are currently around 70 European media listed, not accounting for English outlets which publish both in the UK and USA. Some websites don’t provide scores but are still listed, such as the venerable Rock, Paper, Shotgun, Kotaku or Eurogamer. They are shown on a game’s page, but unprocessed and don’t add up to the final score. This line-up doesn’t change often but it’s worthwhile to check the list on a regular basis. It’s pretty obvious that if you want to have a Metacritic score, you’ll only have to deal with those 130+ outlets which are listed on the site itself. Not only that, a fair number of these might not even be relevant to you for instance if they only cover mobile games (148Apps) or only cover Xbox titles (SomosXbox). The main issue with not getting reviews has everything to with the limited amount of time and manpower most of these media have to cover new games. They are overworked, and at certain times of the year (E3, Christmas period) have all their time booked up by triple AAA titles weeks and weeks in advance. Finding a spot to check out a new game is a difficult undertaking for a critic, especially with the vast amount of games being released. For instance, Steam sees on average between 70 to 120 titles launching every week. You want to know the best way to make your game grab attention AND get those elusive journalists to talk about your game? Do check out this excellent GDC talk from my esteemed colleague Thomas Reisenegger. By the way: did you know that at ICO, we have a free weekly newsletter which will show you all the weekly Steam releases? If you are interested, don’t hesitate to follow this link and subscribe. Smaller media in smaller countries are way easier to reach out to. They have a much a higher chance of being able to spend some time reviewing a game flying under the radar. One of the reasons that there is a discrepancy in the number of high-profile critics for each country on Metacritic is that most of the traffic on the platform is English. Accredited media outlets must submit their own score, plus a written summary in English, to be included on the site. This clearly decreases the incentive for other-language based media to receive the fruits of Metacritic (more traffic, more clicks). What this also means is that media outlets sometimes review a game but forget to submit their score. If they’ve reviewed your game but the review is not yet on Metacritic: give them a gentle nudge and a friendly reminder, and more likely than not, they will update their review on Metacritic. It will happen that reviews will come in with a score that feels unfair. What also happens is that a review can read positively, but the score doesn’t correspond. Also, when you have a multiplatform release, you don’t know under which platform certain scores will appear. All these things can have an effect on the Metascore and one thing we notice with the above concern is that developers or publishers always want to do something about this. Instead of just saying it, better to use the power of the GIF in combination with one of the greatest animated series to underscore this tip. Truth be told, there is little to be done. For instance, most critics specifically list which platform a game was reviewed upon (and this will be duly reflected on which platform the score will appear). The following is a bit bleak but deserves to be mentioned. Asking a media outlet to change a score is a big no-no. The same goes for asking Metacritic to switch scores around. If you update a game after it’s release, expecting an update on a score, it won’t happen. Once an outlet submits a score, it will remain. Who can forget Polygon’s glowing review of 2013’s Simcity, a resounding 9.5 which was duly posted to Metacritic? 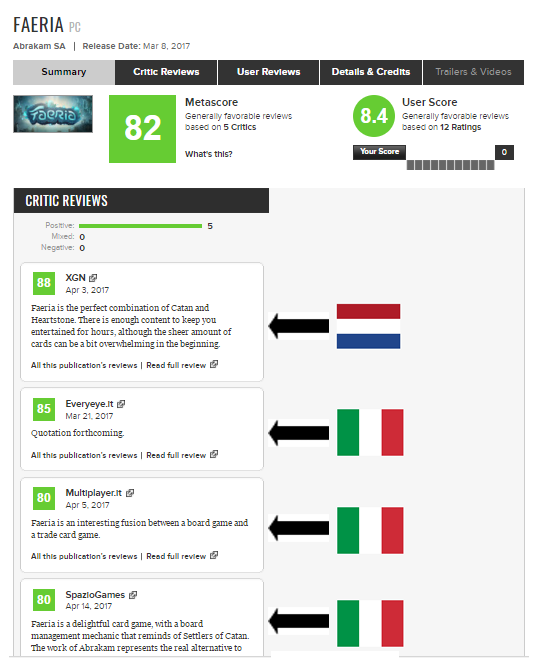 One of the first out of the gate, the review got published before the game had launched, but after server problems snowballed out of control and the game saw some very harsh criticism, Polygon changed their review score not once, not twice, but three times before settling on a final score of 6.5. The original review on Metacritic never changed, as the site’s policy is to only accept a publication’s first score. When a score hits Metacritic, it sticks. Supertip 1: Do your homework on which Metacritic-approved media outlets you’d like to target. Supertip 2: Try to get at least 4 scores in order to get listed. Supertip 3: Reach out to smaller media in non-English-speaking countries. Supertip 4: Focus on websites that take an interest in the genre or specific platform of the game. Supertip 5: Don’t forget to remind media outlets to post their reviews on Metacritic. Supertip 6: Don’t try to change a score. Following up on the two reports that we released last year, we are releasing today another report looking at how video games media cover a specific topic. 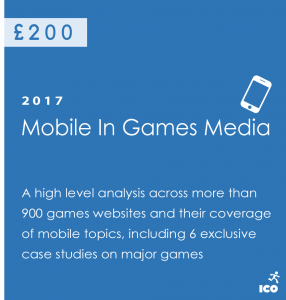 With the mobile game industry steadily growing year after year, we looked into how this segment of the industry was covered by specialist gaming media specifically. 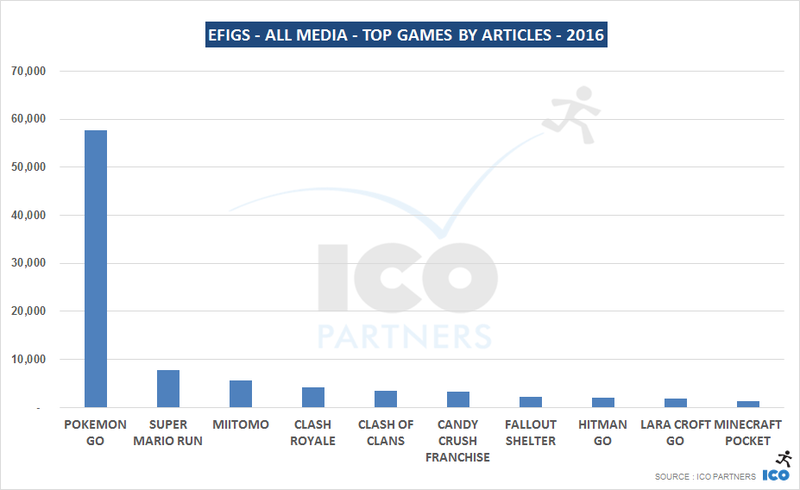 Using a similar format to the one for the report written on VR in games media, we used the data we collect across more than 900 specialist websites in EFIGS to look at the volume of coverage dedicated to mobile topics during 2016. 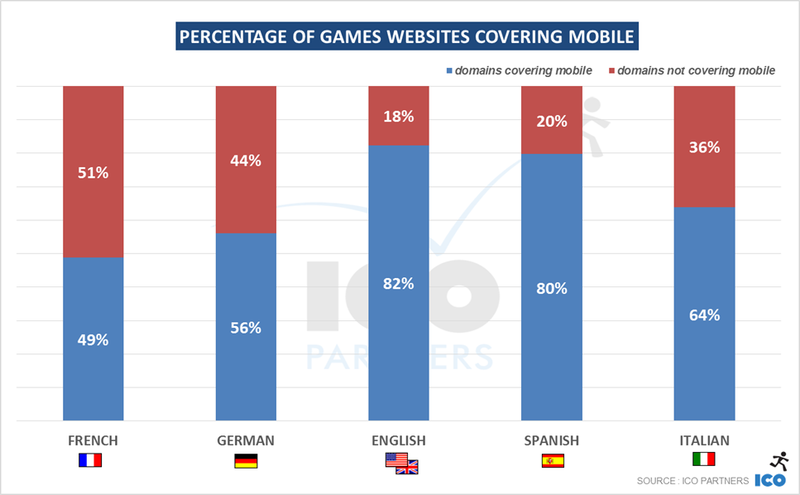 We also chose 6 mobile games and their coverage to analyse in more depth. Here are some of the findings. Looking at the lowest criteria, this shows the percentage of games media that made at least a passing mention of mobile platforms during the year 2016. 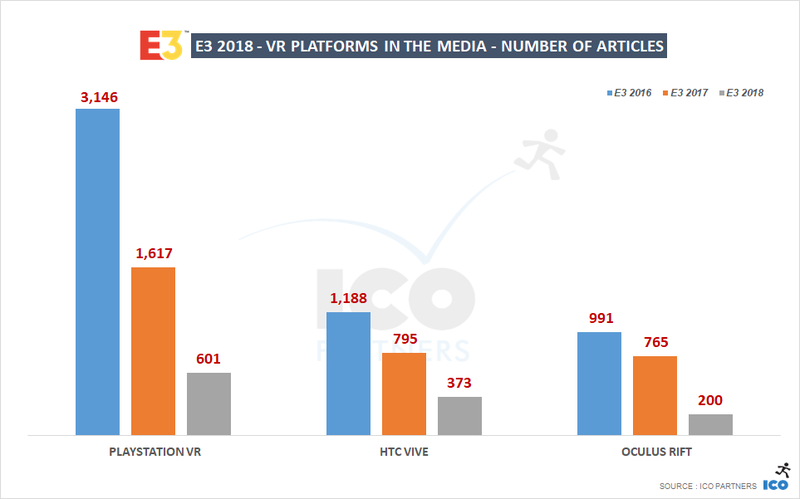 Like with VR, English media are the most likely to cover mobile topics, just ahead of Spanish media. 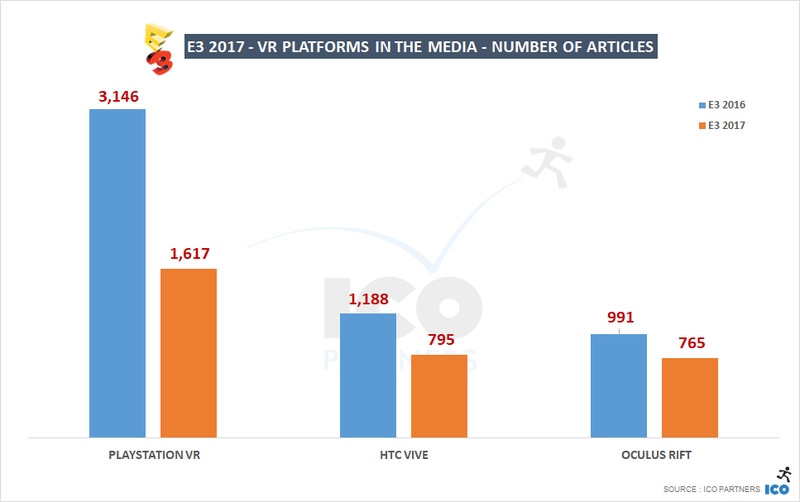 What is interesting to see is that in French, German and Italian games media, VR is covered by a larger portion the websites. 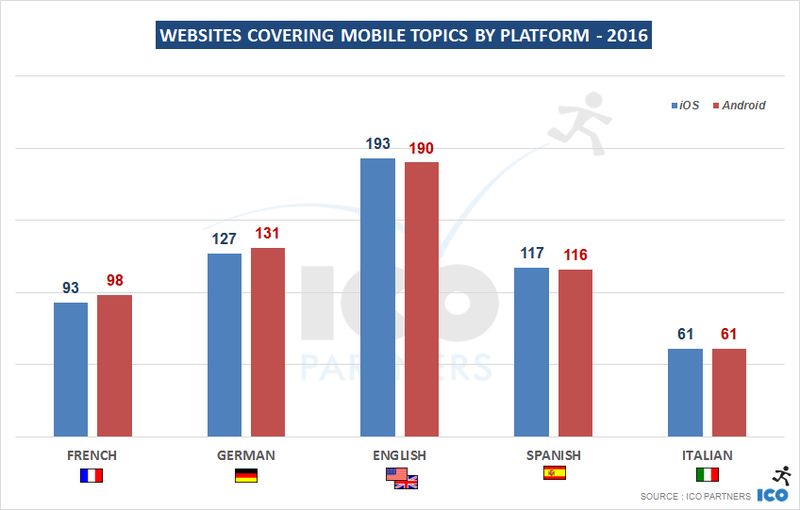 We were quite surprised to find out that, across all languages, both iOS and Android were fairly balanced in the number of sites mentioning them. There was no strong bias for either of the two platforms. This was also true for the total number of articles mentioning the platforms, with only 3% more articles mentioning the iOS ecosystem. 2016 was marked by the Pokemon Go phenomenon, and we had to account for it in the way we presented our findings. 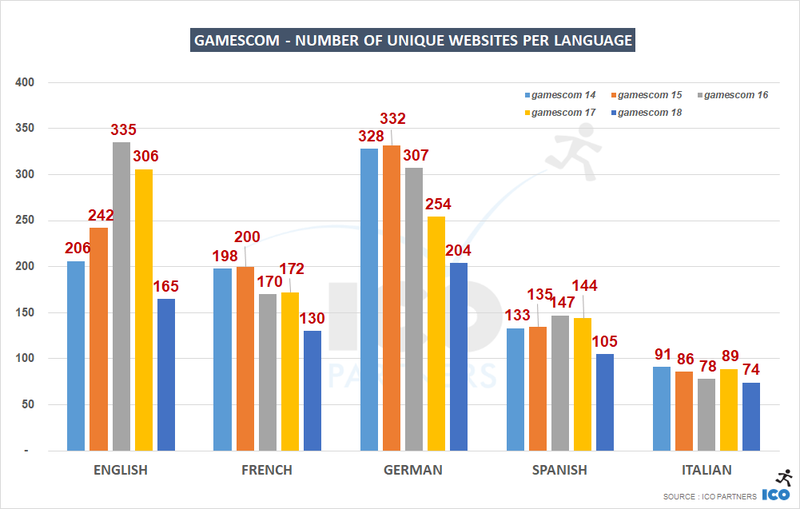 For each language that we analyse, we present the “top games” with two graphs. One with all the games, and one without Pokemon Go. Interestingly, the other Nintendo mobile games got top spots as well, showing the stronger interest media have in mobile projects as soon as a major video game actor is part of it. In the graph above, out of 10 games, only 3 (Clash Royale; Clash of Clans; Candy Crush) are native to the mobile ecosystem. 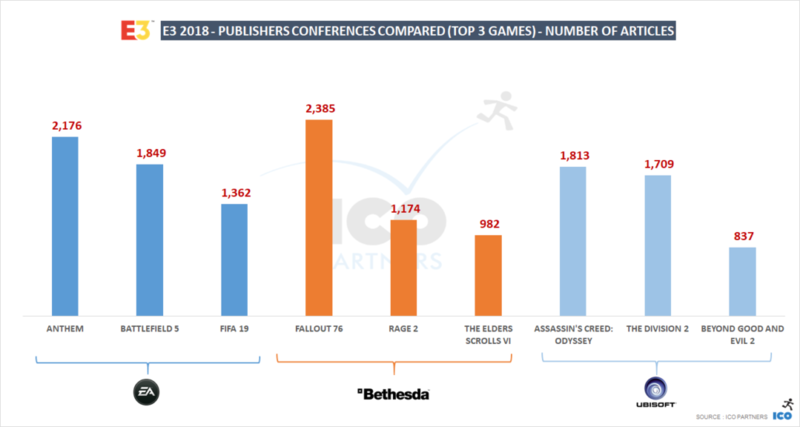 The fact that they are financially far more successful than these other games is irrelevant when it comes to the comparative volume of coverage they received. Following video games news day-to-day tends to warp your perception of what represents a major announcement. Building case studies of specific mobile games was enlightening. The single most successful PR beat for Candy Crush Saga had nothing to do with the game, but was due to the announced acquisition of the game’s studio by video game giant Activision. 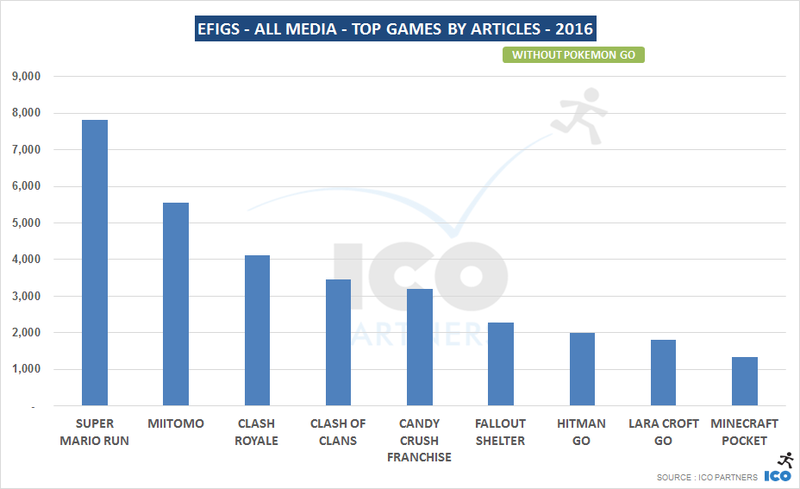 The second most important event was the launch of Pokemon Go, where collateral mentions of Candy Crush were numerous enough to make it a major PR moment for the franchise. You can find further insights in the report – we tried to price it low enough for as many people as possible to be able to get access to it. This is the third article of media coverage analysis for the Nintendo Switch, but it’s the most important one as the console has now been released. While I will discuss previous announcements, you can read again the posts about the console’s first announcement and the January event that revealed most of the details about it. The console has now been widely available for 3 weeks, and we can look at both the announcement, and some level of data over time, to see how it looks for this new console. With our data only going back to early 2014, there are no comparable launches to compare the Nintendo Switch with. For lack of better comparisons, I had a look at the coverage of the first announcements for the PS4 Pro, the PS VR and the Xbox Scorpio, and the coverage of the launches of the PS4 Pro and PSVR. The PS4 Pro initial announcement was during a Sony event, and set out a lot of details for the new machine. The way the communication was structured for it, there was a short cycle between the announcement and the launch (2 months), and the fact the announcement was done outside of other industry events allowed it to garner significant coverage. The initial announcement also served as in-depth reveal for that matter. The PSVR initial announcement (as project Morpheus at the time) was done during GDC 2014, and was still very vague on any details. That first reveal wasn’t massive with media coverage. Interestingly, 2 years later, at GDC 2016, the reveal of the details of the device and its price point was its biggest beat. Project Scorpio (next Xbox One iteration) was first announced during E3 2016, and beyond the fact it would have the highest quality pixels that anybody has seen, Microsoft didn’t provide many details during the announcement. We are basically still waiting for the device’s in-depth announcement, which is likely to be at this year’s E3, leading to a launch before the holiday season. The communication on the Nintendo Switch was very controlled, and beyond the initial announcement and the in-depth reveal, there were no real major beats before the launch. The only other communication was earlier in the week of the launch with a number of indie titles announced (some officially by Nintendo and a good number of others announced by their respective publishers). So, what does it mean for the Nintendo Switch announcements and launch? First, launches are not as exciting as the reveals of the details of the console. By the time they hit the market, the story is a bit dull and generally consists of a reminder of what the console is, probably its line up and the fact that “yes, you can buy it now”. The fact they don’t garner as much coverage as the in-depth reveals despite having a line-up of games immediately available that also should drive coverage seem to highlight that media still prioritise hardware news over games. 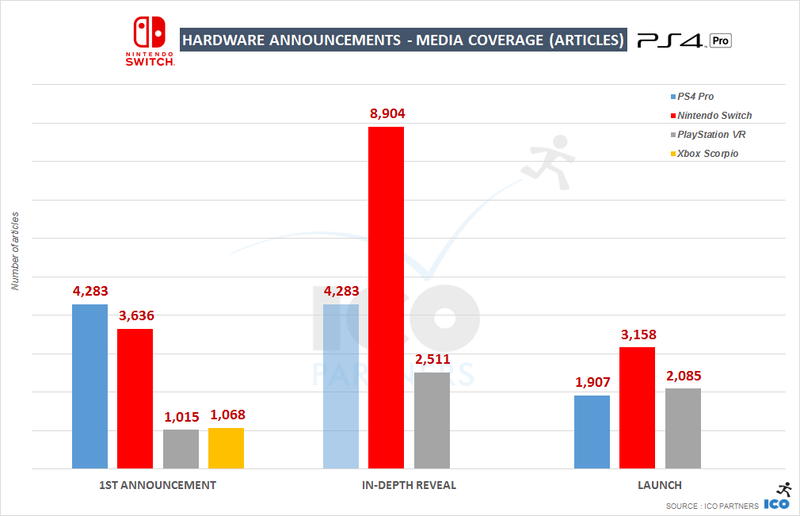 In that respect, the media coverage of the Nintendo Switch, while significantly higher than the other two devices we can compare it to, is nothing incredibly impressive. 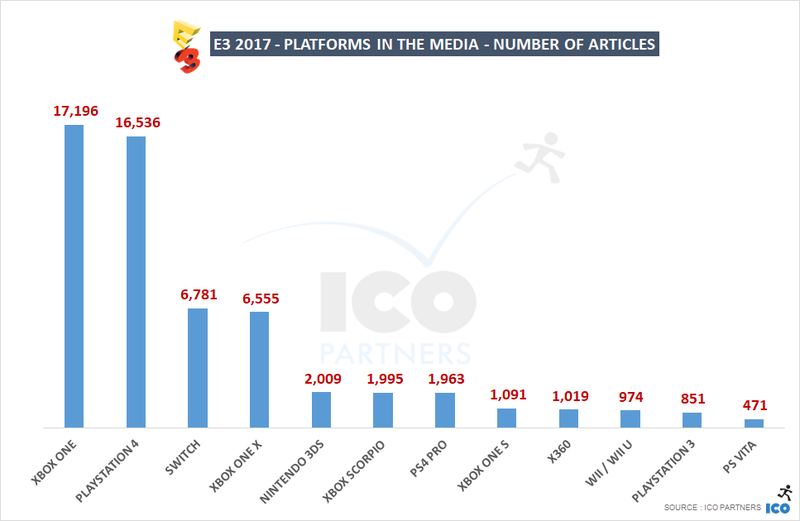 The fact is, there were fewer articles mentioning the Nintendo Switch than the PlayStation 4 on the days of the launch, and that’s probably a direct consequence from the small line-up on the Switch, and the impressive head-start Sony has when it comes to media relations. Second, in-depth events are the ones that matter the most to get coverage. Is it obvious? Absolutely, but I think you should always approach analysis with an open mind and getting evidence of the obvious is still a good take away. What is also very interesting is the relative success of this reveals. The Nintendo Switch being in January, outside of any events, and being quite close to the actual launch, really paid off in my opinion there for Nintendo. 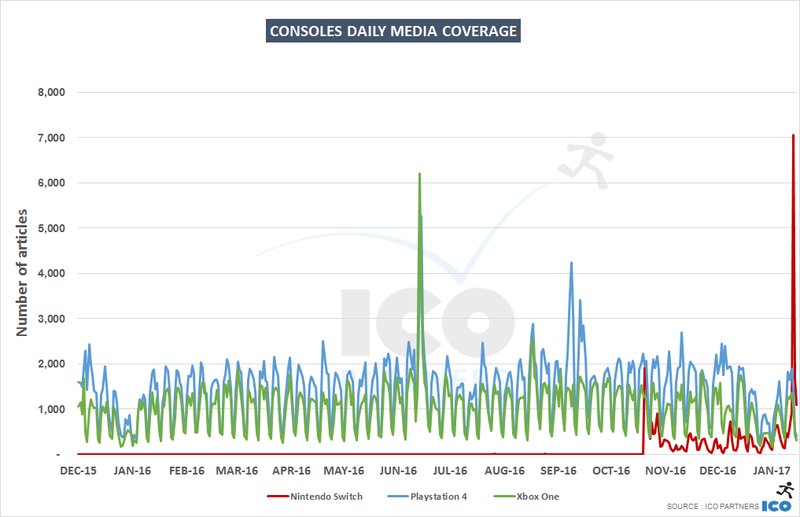 To get a better sense of the Nintendo Switch potential for media coverage, let’s look at coverage over time, rather than at scheduled events. I have added the Wii U to the mix from the graph over time as I think it is essential to understand where Nintendo is coming from in terms of their console media coverage. As we mentioned many times before, the PlayStation 4 is the clear leader when it comes to console media coverage, and this is a constant. 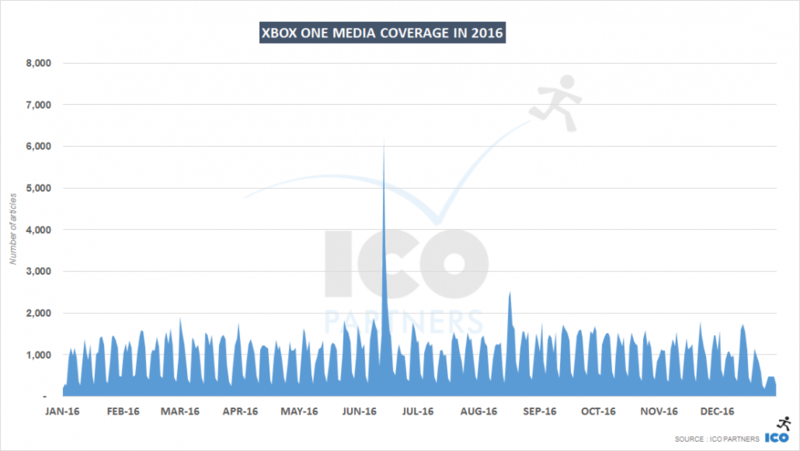 Even when looking at the weekly coverage volumes, since January 2015, only once did the Xbox One secure more coverage than the PlayStation 4. It was the week of the gamescom 2015, where Microsoft held a press conference and Sony did not. The gap between the two is actually widening over time. Microsoft doesn’t seem to be learning from Sony when it comes to making big announcements outside of major industry events. Or even outside of E3. That dependence on E3 seems like a very risky strategy. Yes, E3 is still clearly the most important event of the year when it comes to coverage of the video games industry, but at the moment, Microsoft is not learning how to also do announcements at other times. 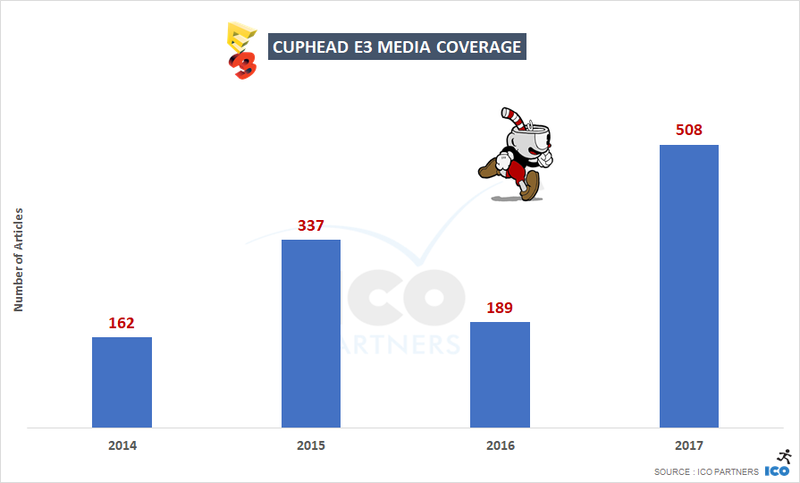 Sony’s September event drove coverage to the level of their E3 weekly coverage, and when it comes to monthly coverage, it was their best month since we started tracking the articles mentioning the PlayStation 4. The Xbox One’s best month was June and E3. The Wii U has been lagging behind the other consoles for a long time now. The decline is clearly visible, and even a major release like Zelda Breath of the Wild doesn’t seem to have much of an effect – it is clear the console is a very low priority for the media. Again, this is not an unexpected result, but we can now see the scale of it. The Nintendo Switch is having an excellent start. Of course, a lot of that coverage is thanks to the January in-depth reveal that got really good coverage, and the momentum of the launch, but for a console with such a limited line-up, it seems that there is significant interest for the console, outside of just the launch. 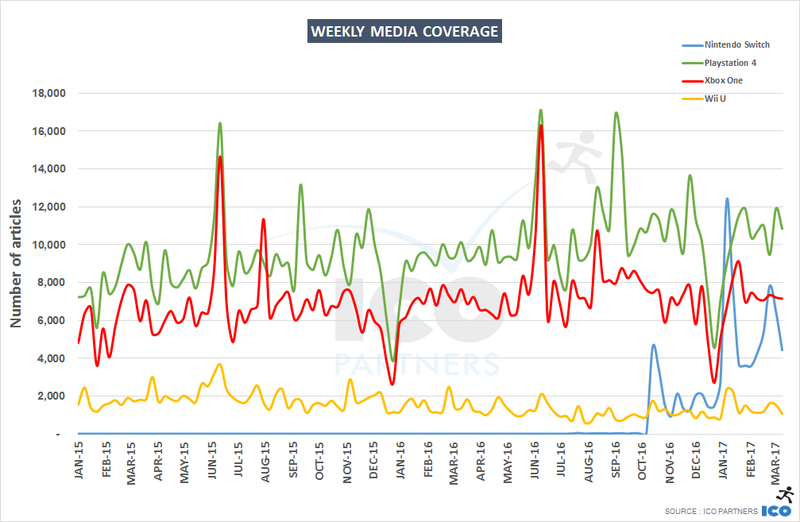 If the average weekly coverage stays around 4,000 articles/week, that puts it a bit above half of the Xbox One weekly average and at 40% of the PlayStation 4 weekly average, which would be an excellent foundation for Nintendo to build on. Nintendo is getting a new console cycle, and the media seem to be keen on supporting it for now. It has a long way to go still, but they didn’t make any significant mistakes so far, and despite a very small launch line-up they secured a decent amount of coverage, and the poor interest for the Wii U doesn’t seem to have damaged the interest for the Switch. They also seem to have learned to make their announcements on their own time and not let major events dictate their calendar. Interestingly, they have just announced that they are planning a “big E3”, which is probably the next important series of announcements for them to get right to stay relevant and present in the media. To complete the usual series of blog posts reviewing the past year, I present to you 2016 and video games in the media. Like last year, bear in mind that we are using our internal tool to collect these numbers, and understanding the methodology is important. It is particularly worth mentioning this year Pokemon Go is definitely making things crazy. Or crazier than usual I should say. In order to account for that, a lot of the numbers presented here are limited to video games media. We do have General Interest and Tech media in our tools, but they are not as exhaustively collected on our end. Let’s address Pokemon Go now. I wrote about the game shortly after the launch, and while things have calmed down since July, the game is still receiving an impressive amount of coverage daily, even at times where there is no new update to discuss. This being said, it wasn’t the number one game mentioned in the games media (important to be specific here), that was Overwatch. Pokemon Go, while announced in September 2015, received very little coverage until it launched in early July 2016. The amount of coverage collected here is basically only 6 months worth, where Overwatch was already well covered prior to its launch in May. 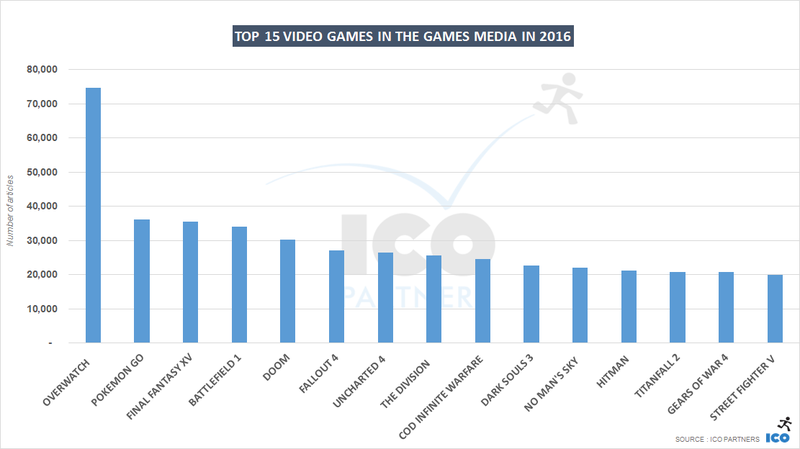 If we compare these numbers to the ones from last year (which take into account a wider range of types of media), Pokemon Go’s performance is striking as it is a Nintendo game (only Splatoon managed to barely get in the top 15) and a mobile game (there were none in that ranking in 2015). 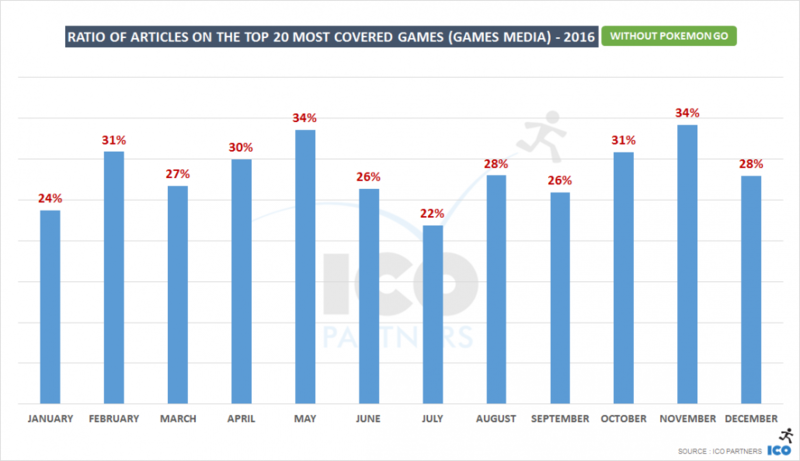 Overwatch is also impressive as it had 50% more coverage than any game in 2015. The online nature of the game, with its constant updates, coupled with the power of the Blizzard brand, pushed the game to the top here, making it by far the game with the most media presence in 2016. Overwatch is also striking in the sense that it is one of the only two new IPs in this ranking (The Division being part of the Tom Clancy’s franchise), alongside No Man’s Sky. 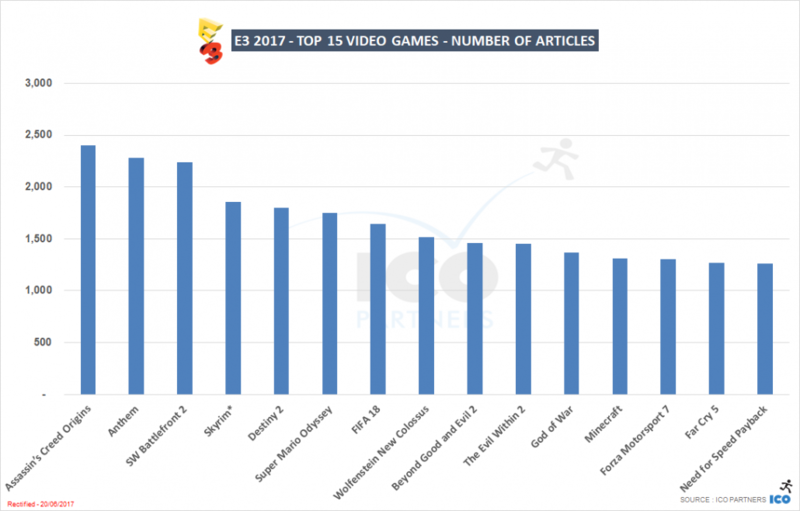 Many industry commenters pointed to No Man’s Sky’s hype as being the main reason for its fall from grace, and you have to give them credit here, when you see the game is in the top 15 most covered by media game of the year, while coming from a small independent studio. Even the Sony PR machine can’t be the only thing at play here, as many very large productions didn’t manage to make it in these rankings. The game’s hype took on a life of its own, and got big. 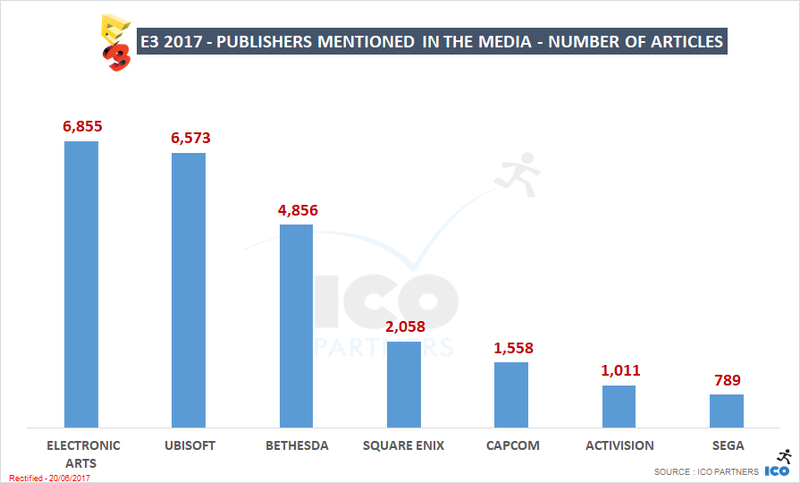 For the fans of the respective series, it will interesting to note that Battlefield 1 secured about +40% more coverage than this year’s Call of Duty game. Year-on-year, Call of Duty’s media coverage dropped about -12%. For a very long time, we wanted to run these numbers. As ICO is also a PR agency, a lot of the discussions with the studios and the publishers come around to the best timing to do a particular communication. The above is a great way to understand when certain periods are swamped, while some are on the contrary very light. You’ll see that I removed Pokemon Go from the data. 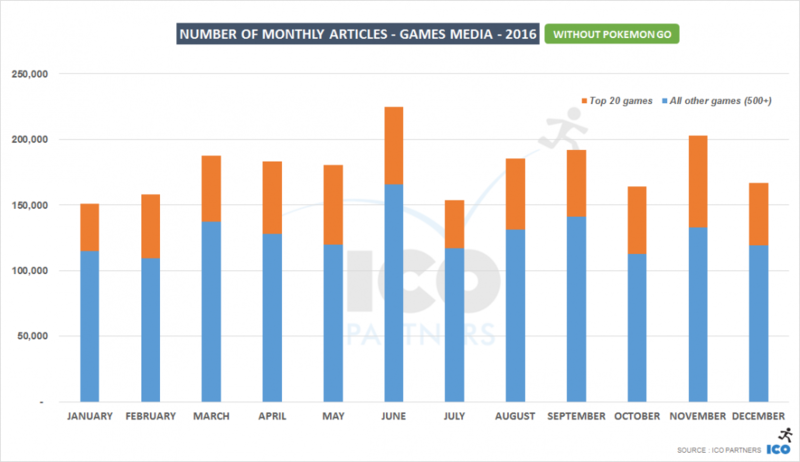 The game was so dominant at its launch that it was skewing the data (more than 7% of the articles in the games media in July 2016 mentioned Pokemon Go). Removing it is not a perfect solution either, but it draws a slightly better picture. You probably want to communicate when the ratio of articles for AAA is lower. It means the coverage is more varied and more likely to be covering your game. From that perspective, November is often deemed a tough month for communications, and both graphs illustrate this well. When there is a lot of coverage, you also have more chances to be covered, however, the communication will also stand out less as higher volume of articles means more noise overall. In that sense, communicating during the E3 period (June) can be a blessing and a curse at the same time. 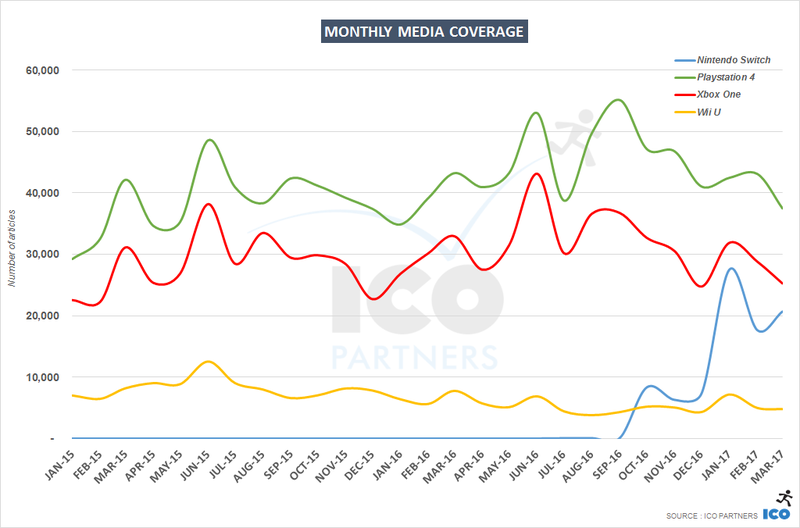 While media coverage does drop during the Christmas period, it is the only time in the year where there is a visible drop in the volume of coverage across all media. It means that any other time, there will always be a minimum number of articles that need to be written, and it can pay off to aim for the periods outside of the AAA games releases, like January or July. While making these graphs, the question came up about the number of games beyond those top 20 games. The truth is, we don’t know how many games communicate in any given month. We do know how many games are released on Steam on average, and this is where the 500+ number comes from. In reality, you can expect all the games releasing to have some form of communication that month, but you would also need to add all the games that are announced, the games that are communicating about their upcoming release, the released games having some newsworthy announcement, like an expansion, or a DLC release, not to mention the live games with significant updates. That 500+ figure for games is quite conservative in truth. 2016 was interesting as far as platforms are concerned. While there were no new console coming out, there were upgrades, iterations and major accessories announced and released. The Playstation 4 and the Xbox One are hitting their stride while the Wii U is in its last year being the main console for the Nintendo line up, with the Switch being around the corner. 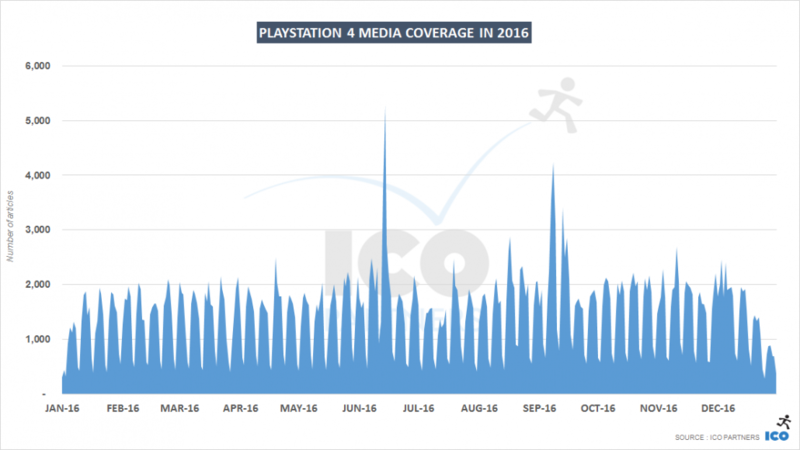 What is interesting in the media coverage is the fact that it was yet again a strong year for the Playstation 4, with even more media coverage than in 2015 (+14%). The console has established its lead, the media follow the trend. The PlayStation VR and the Playstation 4 Pro both helped bring the device in front of the media as well. 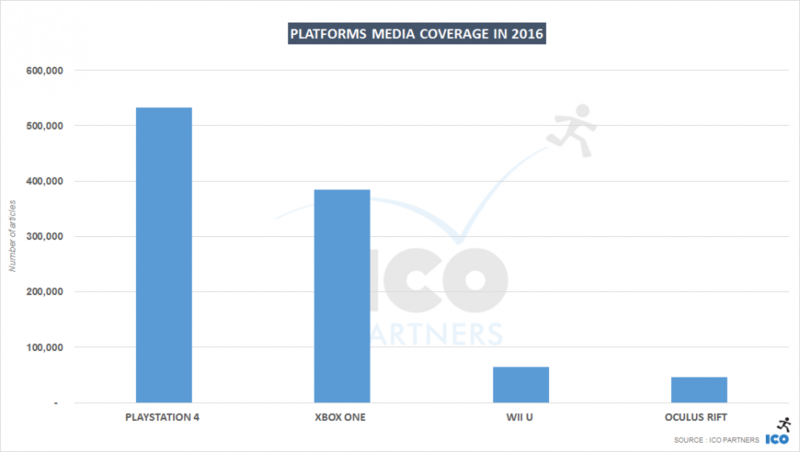 For Xbox One, it was also a good year compared to 2015 (+18%), a growth in coverage not necessarily being a given considering the most important announcement, Project Scorpio, related to a new version of the console to be released in 2017. The Wii U year-on-year numbers see a steep decline overall (-24%). Comparing it to the Oculus Rift, which is a niche platform that had its first release in the year both shows how much Oculus has accomplished, and how much the Wii U has dropped. 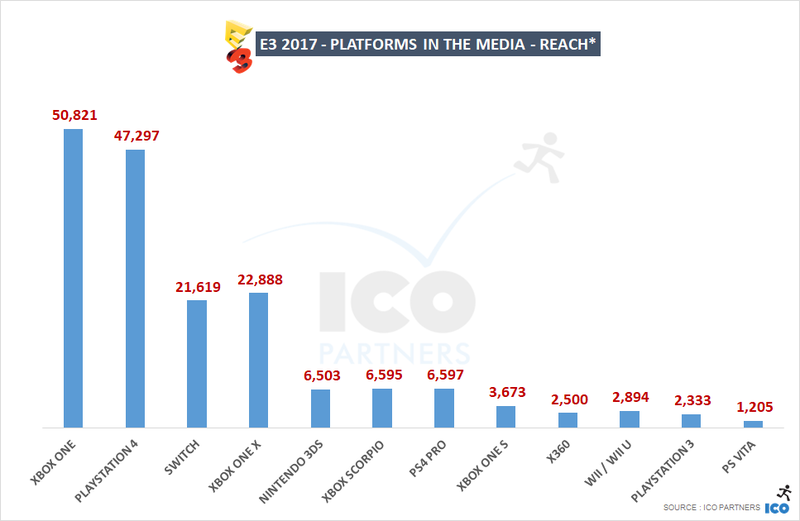 Sony’s communication strategy is well established by now, with most of its coverage originating from E3 and a combination of their own events and industry conferences. gamescom, despite the absence of a press conference, is still an important source of coverage overall, but it does come after the press event ahead of the Tokyo Game Show. And like last year, the Playstation Experience event in early December was a tremendous success for Sony as far as media coverage is concerned. The Microsoft coverage over the year has fewer events sparking spikes in coverage. The two most notable ones are the E3 in June, and gamescom in August, even though, like Sony, they didn’t put a press conference together in 2016. Microsoft seemed to be on the defensive in its communication strategy the whole of 2016 and the fact it still managed to grow the coverage is a good sign. Hopefully they will be more aggressive this year, with the Project Scorpio device coming, to shake things up a bit. In preparation for my upcoming GDC talk “Get Journalists to Cover Your Game: Lessons from Online Dating, Praying and ‘No Man’s Sky‘“ I talked to plenty of high profile journalists to find out what makes them cover games. One thing that kept coming up was that animated gifs – in pitch emails or spotted on twitter – often easily convince editors to check out a game. Also from professional experience of doing games PR for years I can’t think of a better tool to show off your game. Our current approach at ICO Partners when pitching games in emails to media and influencers is to have a snappy headline, two short sentences that explain why they should care about a certain game followed by a nice animated gif and links to the press page and a blog post / full press release. That’s about it. Sounds easy but actually boiling the essence of your game down in two sentences and a 5 second gif is quite a lot of work (but it’s work that pays off). For this reason, I decided to put together a guide for creating easy and pretty gaming gifs, that should give you all the tools you need to let your game shine in a nice animated image. Please note that there are probably more ways to make gifs then there are Final Fantasy games (even including spin offs). The following methods are my favourite ways to make animated gifs from the different ways I’ve tried, but if you have alternative suggestions please let me know in the comments or on Twitter. Working in an PR agency we usually don’t capture gameplay footage for the gifs ourselves. This is why this blog post focuses mostly on how you make gifs if you already have video material in the form of a trailer or a video and want to transform it into a short animated gif. This proved to be a good method to get, with some practice, nice gifs out there within a couple of minutes of work. We are still not sure how to pronounce gif correctly. First, think about what the highlight of your game is, or what you want to show. Maybe it’s a special gameplay feature, maybe you want to explain the concept of your game, maybe the atmosphere, or maybe you just want to show off some nice animations. Depending on that the size, resolution and length will vary greatly, and because gifs are so small in file size you really have to focus your attention on your most outstanding feature. I usually try to think of gifs like little film trailers – you probably won’t have the time to explain all the details your game but your aim is to bring the mood and main selling point across in a way that should make people care and want to find out more. Depending on what you want to show in your gif there are different paths you can take on the recording front. I always decide first I want to a) show short looping gameplay snipped in the gif or b) have a gif that is sort of a mini trailer for the game (perfect for the game announcement or launch). At this point don’t worry too much about file sizes or resolutions, we will compress the gif in the next step. Do however keep your gif length in mind. I usually make them 3 to 10 seconds long for Twitter and email usage. Although this sounds pretty short you can actually fit some good material in there. As mentioned in the intro, working in a PR agency we usually don’t capture footage ourselves but get videos on trailers and transform them into gifs which proves to be a time-saving way with good results (more on that in Option C.). If you instead want to capture footage yourself that is a good option too. In this case I would recommend listening to people that know more about video capturing than me in one of the many online threads and tutorials about capturing footage and moving on to point 3 about gif compression. (Also if you have tips and tools on capturing please let me know Twitter). If I already have a video that I wish to record some gameplay footage from for a gif, I use free software called gifcam (download link). It opens a little frame on your PC screen and captures whatever appears within that frame. Once the software is open, simply have your game or a video of your game (often easier) running and capture the bit you want. Usually my window capturing size is about as big as as a credit card (don’t make it much bigger, you will need to compress the gif anyway) and be sure you record with the maximum frame rate that GifCam allows. In terms of frames per second it’s always better to get a nice raw file and compress it later. Usually it takes a few tries to get exactly the bit you wanted but the software also offers a simple editing engine to remove the things you recorded by accident, or if you want to get a gif that loops in a perfect cycle. This is my favourite way to makes gifs, as it’s usually really quick to do and brings great results! All you need beforehand is a trailer or a video of your game. First some tips on how to cut your video into gif length and then some tips how to transform the short video into an actual animated gif. Load your trailer or gameplay video into a video editing programme. The options here are limitless, from pro software like Adobe After Effects, to free software like Movie Maker or iMovie – anything that can cut video works. I usually use Videopad Pro. It’s very straightforward and costs around $30. Next you cut together the nice little video that will end up es your gif but for now save it any common video format (mov. Mp4 and so on). If you want to show variety you can show 2-3 different scenes and usually I aim to show each at least 1,5 seconds. Otherwise the gif feels messy. Often it makes sense to show different aspects of your game (gameplay vs cutscenes, different levels, different characters) to paint a broader picture of what your game is about. I usually try to pick something eye catching straight from the start, so the viewer sticks with the gif to the end. I would advise showing an end slate for a couple of seconds at the end of your gif. This is just a screen that usually shows your game title and maybe the platforms and / or release date (look at the Northgard gif above – I mean the last part with the Steam and game logos). This is vital information if your gif gets shared around online (otherwise how are people gonna find you? ), and as this is a static image it’s relatively small in file size so won’t add much weight to the overall gif. I usually fade out the ending of the video to a black screen (the last 0.3 seconds or so) to let it loop smoothly. As in the Northgard gif above it’s quite hard to spot if you don’t know about it but it makes the cut to the beginning of the gif smoother. Again, focus on the essentials I would recommend not go beyond 3 to 10 seconds in length if you want to use your gif on Twitter. If your game plays much better than it looks it can help to include a good press quote in the gif if you already have one. Just don’t forget to check back with the editor first to ensure it’s okay to use the quote. Cool, now that you have the raw video version of your gif footage, we want to transform it into a gif. Go to ezgif.com. 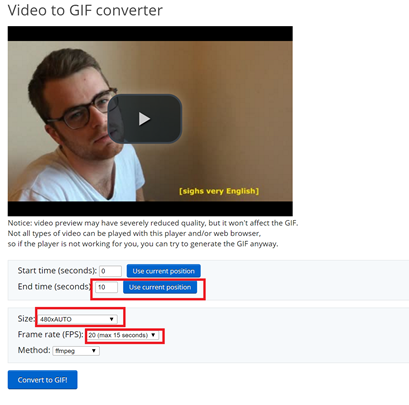 After uploading your gif in the “video to gif options” there are a couple of important variables you can change next. Set the right length. Be sure to set the right start and end time for your gif. By default this option is always set from 0 to 5 seconds. Set the right dimension. Here you can already pick the dimensions of the gif. Usually I resize it later anyway but it doesn’t hurt to pick something that is close to your final output – for gifs for Twitter and emails I often use 480xAuto here. Set a right framerate. In most cases I aim for the 10 or 20 frame option but it really depends on the game. For a more static point and click adventure for example 10 frames will be fine, but for a game where you want to show off gorgeous animations I would rather go for the maximum of 25 frames per second so it looks super fluent, but save file size by reducing the image size and gif length. The best approach here is to just switch between the different options and see how many frames you need to make it look nice. Once you have your gif, the final big step is to compress it to fit your needs. Again, there are probably many ways to do this but my favourite quick and easy go-to solution is also on the website ezgif.com. First, think about where you want to use it before you go to compress your gif. My most common use of gifs for PR purposes is for posting on Twitter, and also for putting straight into emails for media. For these approaches you should aim for a gif under 5MB. That’s the maximum size that Twitter will display animated gifs on mobile (15MB on desktop), and it’s not so big in emails that it will take ages to load – time in which you could lose your audience already. Upload you gif to ezgif.com in the “gif optimizer”. I ALWAYS use the default “Lossy Gif Level 30” option as in my opinion it cuts down the size file nicely while sacrificing very little of the image quality. If your gif looks nice at this point and is under 5MB (or a bigger file size you prefer if don’t need it for Twitter including mobile or emails) you are DONE! 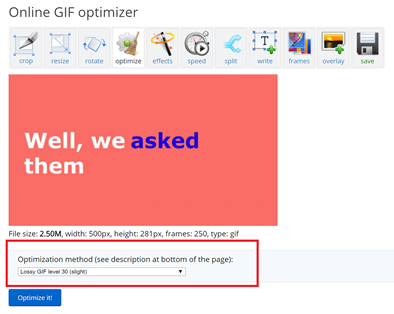 Use the medium and high levels of the “Lossy gif optimisation” option on ezgif.com. Depending on the game (for games with fewer little details and diverse colours for example) this can save you a lot of file size for little quality degradation. I always give this a try to see what it looks like. Use a lower framerate. Either by going back to the “video to gif” option on ezgif.com and saving your video with fewer frames, or by using the “give optimizer” and the “drop frames” option. After all those steps and some playing around you should have a great looking gif! Back in October, I did an analysis of the announcement of the Nintendo Switch. It was a rather short one, with very few details shared at the time, with the promise of a more in depth presentation following an event in January. That event was last week, and now is a great time to look at how it went for the Nintendo teams. 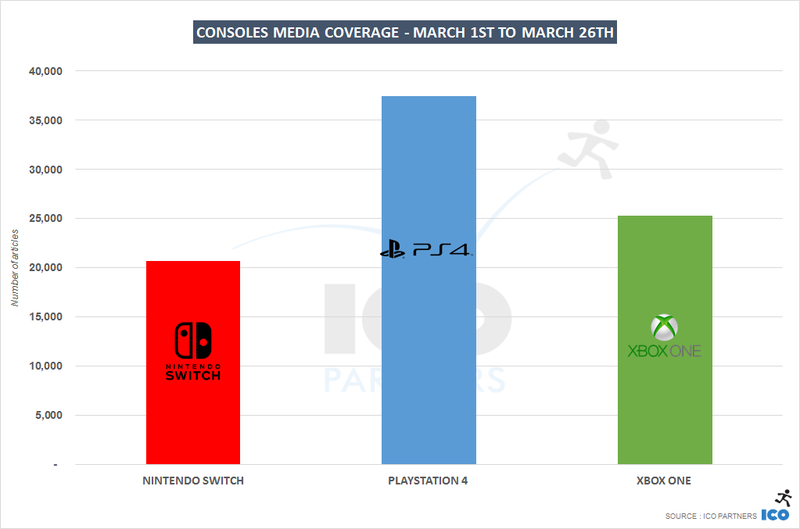 There is no question that, of the three console manufacturers, currently Nintendo is lagging behind Sony and Microsoft and that is very apparent when looking at the media coverage of each console. 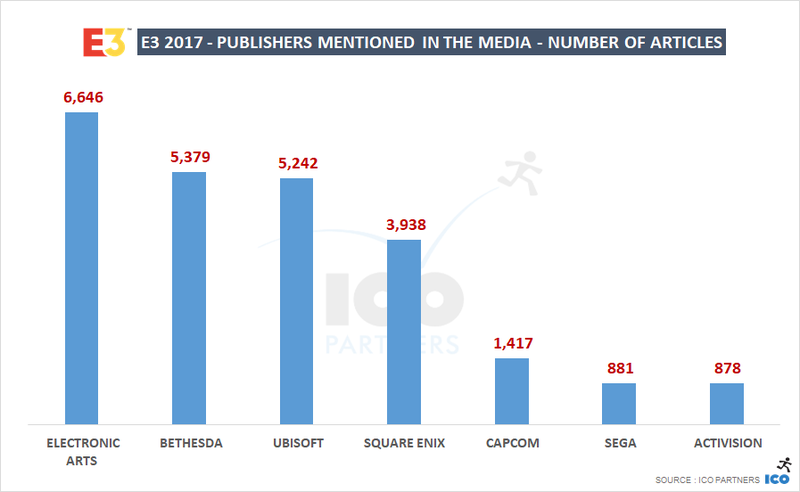 In the video games media landscape report that we shared last year, Nintendo received less than a third of the articles that PlayStation had. In that respect, the Switch announcement seems to have been fairly well covered. We are lacking data to compare it with other console announcements, though. 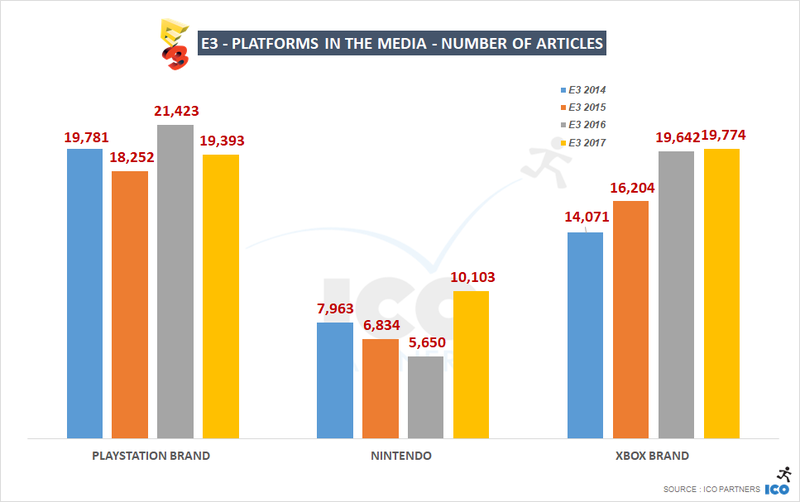 While it is not surprising that the main event showcasing a new console is the single biggest media event for Nintendo in the past 3 years, the scale it reached is significant. It is the single biggest announcement in terms of volume of coverage across all 3 main consoles for that period of time. For Nintendo, a company that is struggling to compete with the media attention its two contenders receive, it looks like a massive achievement. And with the new cycle of consoles being upgrades from the current gen, rather than brand new iterations, this might stay true for a while for all we know. * Minecraft numbers are only for articles explicitly naming the Switch and Minecraft. Nintendo’s first party titles – they benefited from the full support of the firm’s communication effort. It’s also interesting to note that existing licences are performing better than the new brands. This is very normal of course, but interesting to actually see it in numbers. 3rd party titles from key Japanese licences – I put in this bucket Bomberman, Fire Emblem and Xenoblade, that all received 400+ articles from the event. Other 3rd party titles – this is of course more varied and spread out, but I think it’s worth noting Snipperclips and Octopath both securing more than 200 articles – no small feat for projects with their profiles. That’s it for me (for now).